Looking for a brake upgrade. I have 1LA 320mm disks on a t A5 3.0TDi quattro. looking for a cost effective solution. Thinking second hand RS calipers if that is a solution, probably wouldn't want to remortgage to get a full on Brembo setup but if that is the best cost efficient solution that is what I'll get (just much later). Thanks for the PM but I can't reply yet (Newbie). Im planing to upgrade my breaks as well 3.0 TDI. I have S5 callipers with 320mm rotors at the moment. Just waiting for RS 8 pots callipers and 365mm rotors to ne delivered. Just out or curiosity, you didn't buy the S5 calipers did you? Just that they are exactly the same as the standard A5 calipers, just painted in gloss black with an S5 plaque/badge. With the rear RS5 set, you do know you have to change the rear suspension too? Proper rs5. Why i need to change suspension? I'm not sure of the exact details, but the RS has a wider rear track and there is some conflict with fitting the RS rear brakes to an S or A model. There is info online and on this forum about it. Some say a spacer behind the disc works, but I'm not sure. Some say there is no point for the cost of adapting the hub/suspension to get the RS brakes to fit and opt for an aftermarket setup. They don't just bolt straight on. The reason for them was bigger rotors. You can use the Rs5 calipers and carriers and use the S4/S5 disc, that's what I've done. Yup those calipers with the S5 discs and you'll be fine. Last edited by x3me; 5th March 2019 at 10:04 PM. So am I right in saying S5 discs with RS calipers work on A5 that have 320mm front discs? And they bolt straight on? I thought allroad too but didn't want to say in case it's some aftermarket arch kit. RS models have 380mm front rotors/ discs and a bigger Caliper & the shield ears need bending for clearance. 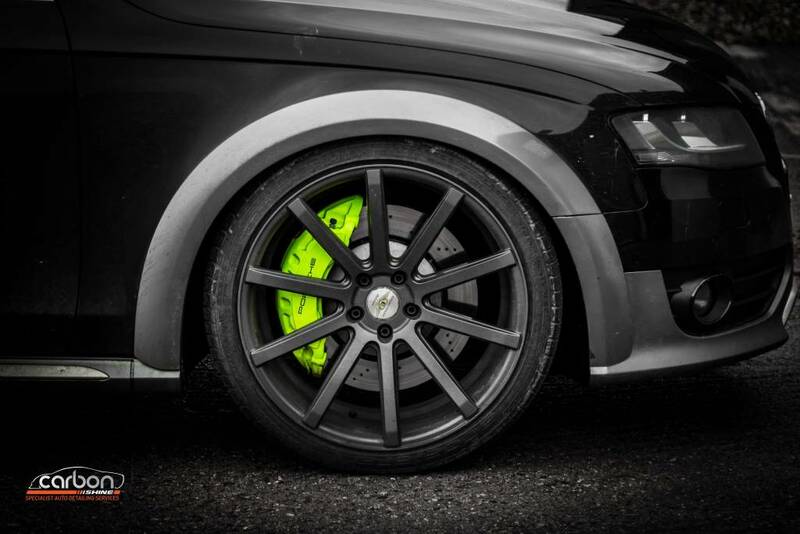 S4 & S5's have wider 345mm vented (front) discs, and can be an inexpensive straight swap/ upgrade as the Calipers are the same on the A5 as the S5 (S4/5 just have a badge), however the Hangers/ carriers are wider to take the 345mm vented Discs, as the A4 & A5 only have 320mm discs. The fronts will do most of the work, so it's an option to leave the rear calipers and just add paint & discs to match the fronts if you go for grooved or drilled ones. So with the A5 to S5 upgrade, once you have the bigger discs and carriers then yes, its bolt straight on. RS models have 380mm rotors/ discs and a bigger Caliper & the shield ears need bending for clearance. S4 & S5's have 345mm (Front) discs, and can be an inexpensive straight swap/ upgrade as the Calipers are the same on the A5 as the S5 (S4/5 just have a badge), however the Hangers/ carriers are wider to take the 345mm vented Discs, as the A4 & A5 only have 320mm discs. This is correct but.....if you want to upgrade your brakes I would seriously think twice about using the S5 setup. Obviously it all depends on how you drive but I find that a few spirited stops in my S5 and the brakes really start to complain and fade (oem Audi pads currently). When my pads are ready I'll try some different ones and if no improvement I'll probably change the discs/calipers for a different setup. I don't know how bad the 320mm brakes are but I bet the 345's aren't much better. Fair point- pads are key. I have the S5 (front) set up with 345mm vented drilled and grooved discs, and Ceramic pads all round- Hawks on the fronts & Akebono on rears, and I've also added vents in the front inner wheel arch lining that are fed by the open mesh Fog light grilles- resulting in a huge improvement from the stock A5 set-up, no complaints at all- and as I've got 333bhp to play with (same as S5) it's really important to be able to cope with the extra demand. There won't be a lot of difference between the A5 and S5 up front as the disc is only 25mm bigger and uses the same pads/caliper. The rears are more of an upgrade as they are 30mm bigger and vented. But the rears require the S5 caliper and carrier too as the disc is thicker due to the ventilation. I have Redstuff ceramic pads all round, mainly for the reduced dust than performance. I find the stopping power the same as standard. But high motorway speeds and a good press will see them complaining a bit! I've had my discs all blued, front and rear. They do stop well, but trying to stop a 1650kg car at triple digit speeds will require better than standard pads. I very nearly went for the x drilled Brembo discs, but at the time my budget only allowed for the std discs. Yeah the dust even after one journey is horrendous with the stock pads and plays havoc with my ocd. So definitely going to try ceramic pads next. Chestermix and pfield69 like this. As for fade, I have always used EBC Reds. No fade even on my turbo nos E34. I always change brake fluid to DIT 5.1 & flush every 2 years. Never had fade. They are quite rare on their own, normally come with the calipers and even discs. TRW sell them at around £50 each. I've just bit the bullet and gone from OEM 320/300 on my 09 3.0tdi and gotten a full set of S5 disks, calipers and carriers for 700 from eBay. I've managed to warp pagids, brembos and OEM disks on my car. Thankfully the disks are currently being replaced under warranty by Audi as they have only been on for 2k miles. I'm looking forward to the 345/330 combination once they are fitted. As for rs5 brakes, you need wider set rear suspension owing to wider rear calipers and disks from the rs5 and you need at least 19" rims.